After a delayed start, the Mavericks Invitational surfing contest began under sunny skies Sunday. The first of four heats was set to begin at 8 a.m. Sunday, but was delayed a bit as officials waited on Mother Nature to bring in the waves. Two dozen of the world's best surfers rode the monster waves of the infamous Mavericks surf spot near Pillar Point Harbor in Half Moon Bay. By the end of the day veteran Santa Cruz surfer Peter Mei was declared the winner. Mei is a well-known Northern California surfer with two decade's experience surfing who helped launch the tow-in surfing movement locally, according to competition organizers. He also had a win in August in Pico Alto, Peru on the second stop of the annual Big Wave World Tour. Scott Budman explains how the company GoPro is playing a up close and personal role in this weekend's Mavericks surf contest. The waves were described as powerful, but "lully" with lots of long breaks in between. Three of the big wave surfers did not compete. Kelly Slater did not give a reason for withdrawing. Shane Dorian can't compete because of a shoulder injury. Carlos Burle also can't compete due to a shoulder injury. They were replaced by back ups. 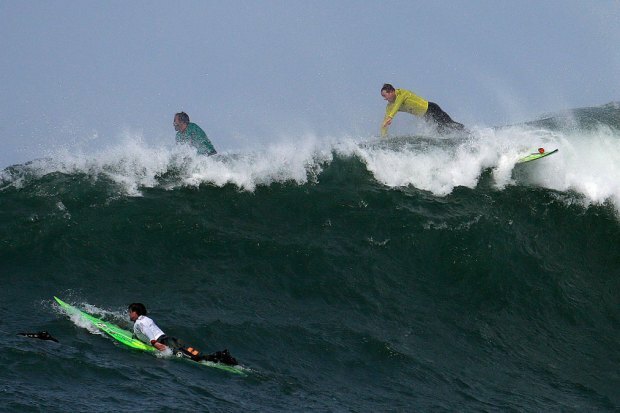 Organizers downgraded the size of waves they were expecting in the hours leading up to the contest. They said they would be in the 15 foot range instead of the 30 foot range as predicted earlier in the week. National Weather Service forecaster Bob Benjamin said that the waves were cresting between 7 and 10 feet at locations along the coast, with the highest waves at Mavericks reaching just over 15 feet. 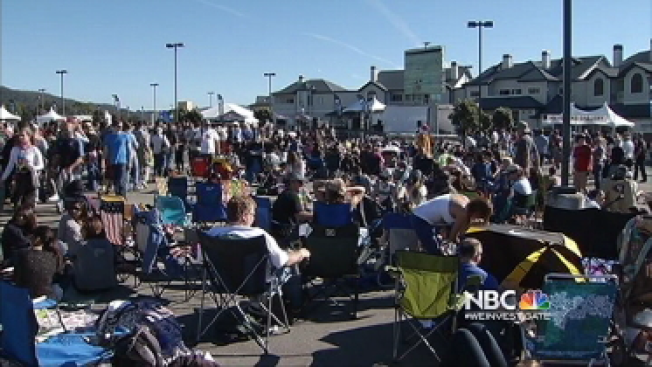 Thousands of people turned out to watch the contest on big screens set up at a nearby festival. In 2010, some 40,000 people showed up. Organizers said this year's crowd was at about 30,000. The decrease in number was due in part to the 49ers NFC Championship game which aired nationally at noon. "The festival filled up and the competition appears to be going well," Rebecca Rosenblatt said midday. "Everyone is being really cooperative and having a good time." This year spectators were not be allowed on coastal bluffs or beaches overlooking the break. In the past rocks have fallen an injured people sitting on the cliff. Waves have also knocked spectators to the ground causing serious injury to those watching from on the shoreline. The sheriff's office reported no arrests and said no one trespassed on the fragile bluffs above the break that were closed to the public this year for safety reasons. The U.S. Coast Guard reported no incidents on the water associated with the contest. While the professional surfers yearn for the huge waves, they are a danger to the rest of us. The National Weather Service has issued high surf advisories for much of the coast through Monday night. The Coast Guard and National Park Service are warning swimmers and boaters to be on the lookout for rip tides and sneaker waves that could reach heights of 20 feet.